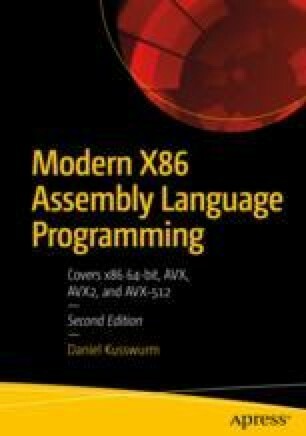 In Chapter 7, you learned how to use the AVX instruction set to perform packed integer operations using 128-bit wide operands and the XMM register set. In this chapter, you learn how to carry out similar operations using AVX2 instructions with 256-bit wide operands and the YMM register set. Chapter 10’s source code examples are divided into two major sections. The first section contains elementary examples that illustrate basic operations using AVX2 instructions and 256-bit wide packed integer operands. The second section includes examples that are a continuation of the image processing techniques first presented in Chapter 7.